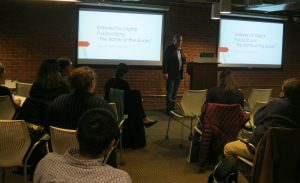 The Digital Publications Indexing SIG co-organized a meeting along with the New England Chapter of ASI and Bookbuilders of Boston, held Thursday evening, April 5, 2018, at the offices of the textbook publisher Cengage Learning, which is also an organizational member of ASI. The program theme, “Indexes in Ebooks and Embedded Indexing,” brought together three speakers and an opportunity for discussion. 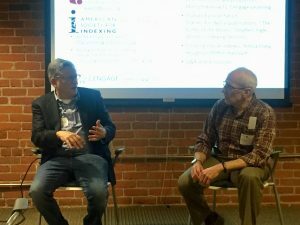 As most of the 22 attendees were members of Bookbuilders of Boston, it was an opportunity to raise the awareness of embedded and hyperlinked ebook indexing among publishers, so that they don’t simply discard the index in ebook editions. The evening’s featured speaker, Stephen Ingle, President and CEO of WordCo Indexing Services and a past manager of the Digital Publications Indexing SIG, addressed the issues that publishers face with digital publications in his presentation “Indexes for Digital Publications: ‘The Battle of the Books’.” The issues to be “battled” and resolved include: whether or not to even have an index in a digital book/ebook, whether a hyperlinked index should be page-hyperlinked (usually based on what was the print page) or precision-hyperlinked (to an element, such as a paragraph), and whether indexes should be fully functional. Fully functional may include allowing user input, taking advantage of the digital potential, and giving the user an improved experience over print. Marty Rabinowitz, Executive Director of Content Services at Cengage, presented briefly on how Cengage currently handles the indexing process for print products and what is done with ebooks and courseware. Marty raised issues and questions: Do customers find value in indexes? Is it worth the investment? Should we make the same investment for digital indexes as we do for print? Teresa Elsey, Senior Managing Editor of the group that produces ebooks for the Trade division of Houghton Mifflin Harcourt, presented the process for and issues in converting indexes created for print books into hyperlinked indexes for subsequent ebook editions. Good questions were raised during the Q&A, and there was time for discussion and networking. The Digital Publications Indexing SIG and the New England Chapter of ASI provided food, and there was a table of ASI information literature and copies of Steve’s articles on digital publications indexing which also appear on the SIG website. View Steve’s presentation, “Indexes for Digital Publications: ‘The Battle of the Books’,” on this SIG website. Many thanks to Heather Hedden and Iris Febres for putting this together!